When dealing with a stain, a lot of people think they can improvise. After a spill, they head to the cleaning cupboard, pick what they believe might work, and give it a go. When that doesn't remove the stain, they try something else, then when that isn't successful, they bring out another product and on it goes until they end up making an even worse mess. Keep in mind that every time you add another chemical, you change the stain's chemical signature. For example, if you spill red wine on the carpet, clean it with bicarb and vinegar; however; if you've mistakenly used soda water; then a spot remover, you can't can't then just use bicarb and vinegar because the stain signature has altered. You're no longer dealing with a simple red wine spill - you have to remove the new stains you've created in addition to the red wine stain! The take-home message from this is: fist, work out what the stain is, then what the surface is and fix it. Work out what the stain is made of: is it protein, fat, chemical/biological dye or resin/glue? Know what the surface is - the kind of fabric, flooring, benchtop etc. that you've stained. Know the appropriate chemicals to use to remove the stain. If in doubt, speak to an expert. Try to minimise the number of chemicals you use. Unless you know it will work, always do a test patch first. It's a good practice run! Never spot clean stains on your carpet within four weeks of it being stream cleaned. Vacuum clean the carpet four times before you spot clean it as spot cleaning stains can adversely react with steam cleaning chemicals. Never use excessive water or moisture on carpet. More is not better! Wear appropriate clothing, such as gloves, goggles and mask, especially when using heavy chemicals. Don't make chemical mixes you don't understand. Mixing certain chemicals can create toxic fumes. You could add one chemical to another and create a toxic fume, ruin a surface or even have an explosion! Remove stains as soon as you notice them. Don't wait - they become harder to shift with time. Stain-removals solutions are not interchangeable. You can't use advice relating to carpet on your woolen jumper . Every surface is different. There is no substitution or approximation. If you don't know, get expert help. Protein stains are one of the trickiest to remove because you must not use heat, detergents or many commercial spot removal products on or near them. If you do, it sets the stain. It's just like cooking an egg which goes hard as soon as you add heat. Many proprietary cleaning products will set protein stains. The best way to remove protein stains is with facial soap, cold water and, if it's on carpet, a little water. Scrub soap on the stain, then blot it with a paper towel until it has been removed. Protein includes any animal product such as blood, gravy, meat, eggs, cheese, milk, seeds and beans, Once you remove the protein part of the stain, you can then apply heat to remove other stains. Oil, grease and fats include vegetable oil and butter. The best de-greaser is dish-washing detergent. You can see how it works when detergent is added to a greasy sink! Be aware that fat stains are often combined with protein stains. If food has been cooked in oil, or has fat in it, such as a lamb chop, the protein part of the stain has to be removed first. Make-up generally contains lots of oil too; detergent is the solvent to use. The best way to determine oil stains is by rubbing the stain between your fingers - fat and oil make your skin slippery and shiny. To remove them, use detergent and warm water. Only use the tiniest amount of water on carpet or upholstery. Carbohydrates are starches and sugars. They're found in potato, rice and paper glues. The best way to deal with these stains is to allows them to dry, then brush or vacuum them out. For example, if you spill rice on the carpet, remove any solids, pat the area with paper towel, leave to dry then vacuum. If the stain has any other component, such as salt, dilute with a little water first, then apply the process describe above. For sugar stains, add a little vinegar or a little detergent to help break then down. Inks, paints and dyes require a solvent. Vegetable dyes, such as those found in artificial or naturally coloured foods, are best removed with sunshine. If you can't get the stain in the sun, use an ultraviolet light which can be hired from the chemist. Sponge the area with a small amount of equal parts lemon juice and water then aim the ultraviolet light over the stain. Check the stain every 2 hours until it fades. Some vegetable dyes oxidise, which means they respond to oxygen in the air - like a cut apple turning brown on its surface. As they oxidise, a tannin stain is produced. Remove tannin stains by wiping with a little glycerine, leave for 15 minutes then sponge out with a cloth that's been wrung out in vinegar. Repeat until the stain is gone. The glycerine takes the stain backwards in time a little. This procedure is particularly good for beetroot stains. 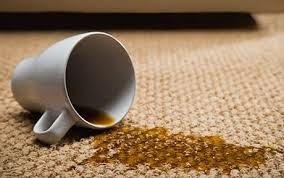 Again, if the stain is on carpet, don't use too much moisture. To remove paint stains, you need to know if the paint is water-based, acrylic or oil based. For children's water-based paints, remove with soap and water. For acrylic house paint or tube paint, use methylatd spirits. If oil-based, use white spirit/dry cleaning fluid. Resin stains require a chemical solvent. For apoxy resins, use acetone. You must use acetone and not nail-polish remover. Take care using heavy chemical solvents. Be mindful that the solvent may break down surfaces around the stain. For example, white spirit/dry cleaning fluid will break down paint, so only apply the solvent to the stain itself, rather than the surrounding area. Be careful how much you use. Beer (including dark beer) Paint a paste of Napisan Oxygen on the stain and leave for 15 minutes. Then wash normally. Beetroot Treat with glycerine before washing normally. Bird droppings Wash fabric normally. Blood Wash fresh bloodstains through the washing machine on the cold setting. If you can't, use cornflour and water. For old bloodstains, use cold water and soap. Chewing gum Harden the gum with ice and cut as much of as possible with scissors or a blade. Then apply dry cleaning fluid with a cotton ball, sprinkle talcum powder to absorb it and work the remaining gum out by rubbing in circles. Chocolate First clean with soap and cold water. Then clean with soap and hot water. Coffee or tea For fresh stains, use glycerine applied with a cotton ball, then wash in washing powder. For old stains, use glycerine, then dry-cleaning fluid and detergent. Deodorant Use dry-cleaning fluid before washing. Fruit juice Use detergent and sunshine. For stone fruits and fruits with a high tannin, treat the stain with glycerine first. Grass Use dry-cleaning fluid before washing in washing powder. Grease and oil Detergent suds. For heavy staining, soak in baby oil first. Hair dye Dry-cleaning fluid or kerosense, or hairspray if you can get to the stain immediately. Ink or ballpoint pen Rotten milk or dry-cleaning fluid. Use glycerine first on red ink. Lipstick and make-up Dry-cleaning fluid. Milk Wash normally on cold cycle. Mud For red clay mud, apply dry-cleaning fluid then wash. For black mud, wash in the washing machine. Nail polish Apply acetone, not nail polish remover. Paint For water-based paint, use methylated spirits. For oil-based paints, use turpentine. Rust Use CLR or lemon juice and salt. Shoe polish Use methylated spirits. Soft drinks Treat as though it's fruit stain because soft drink are made of vegetable dyes. Sweat Make a paste of Napisan Oxygen and water and leave on the stain for 15 minutes before washing normally. Tar Use baby oil, kerosene or dry-cleaning fluid. Urine Wash in washing powder and dry in sunshine. Vomit Washing powder, sunshine or Napisan, washing machine and dryer. Wax Ice, dry-cleaning fluid, talcum powder. Wine New red wine - vinegar. Old red wine - glycerine, bicarb and vinegar. White wine - vinegar. It's a well-known phrase, but a good one. Ask yourself before you embark on an activity; what can go wrong and how can I prevent it? Try to anticipate potential stains and put into place measures to avoid them. For example, for high dirt areas, spray carpet with Scotchgard (this works on shirts as well); use old newspapers on the tops of cupboards to capture grease and grime. Don't do things like serve spaghetti bolognese on white shag-pile carpet - your're just asking for trouble! Create specific areas for doing messy jobs. For example, clean shoes outside or on several layers of newspaper. And remember: when removing stains from carpet, always rinse chemicals out after you've cleaned. This applies even with basic chemicals such as vinegar and milk. If you don't you'll be left with bad smells and more stains. When doing the laundry, prevent disasters by reading the labels on your clothes. Use the recommended washing temperature. If the information isn't included on your clothes, I recommend washing in warm water - unless there's a protein stain. If there's a protein stain, wash in cold water. Warm water relaxes the fibers and makes cleaning easier. To avoid shrinkage, use the same water temperature in the wash and rinse water. Wash woolens in blood-heat water. For new garments, put the iron on a cool setting in case the garment contains a fiber, such as elastin, that reacts with heat. You don't want to end up with a shriveled shirt! Never iron clothes with any stains on them because you will set the stain. Since cleaning is essential for a healthy comfortable lifestyle, make it fun: stick a smile on your dial and do it together. Alternatively, you can always get a free quote from one our accredited Auckland commercial cleaners.